Crock Pot Sausage breakfast casserole recipes are great to make on a weekend when you want to serve a delicious breakfast but don’t want all the dirty dishes the cleanup. 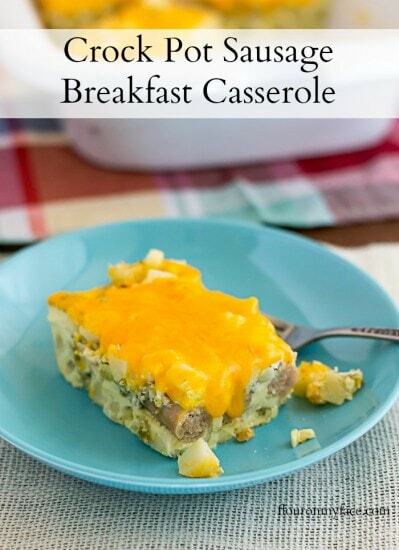 This Crock Pot Sausage Breakfast Casserole has all your favorite breakfast ingredients in it. I made my Crock Pot Breakfast Casserole recipe with chicken link sausage I picked up at Costco. You can use any type of sausage you like. A few ideas are pork sausage links, crumbled ground pork sausage, turkey sausage, or pork sausage patties. All good breakfast casserole recipes have the standard eggs, cheese, and potatoes. I used Potatoes O’Brian Hash Browns but you could use any type of hash browns or potatoes you have on hand. Or you could use English Muffins instead of potatoes like I did when I made my Crock Pot English Muffin Breakfast Casserole recipe. 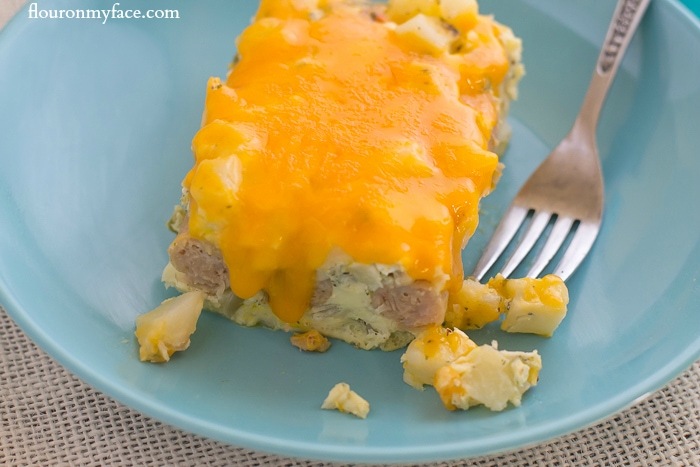 Or this Velveeta Cheese Breakfast Casserole recipe could be made in the crock pot instead of baked in a casserole pan. Spray the bottom and sides of a casserole crock pot with vegetable spray. Sprinkle half the Potatoes O’Brian over the bottom of the crock pot. Arrange the link sausage evenly over the hash browns. Cover the sausage with remaining hash browns. Beat the eggs, sour cream, milk, salt, pepper and parsley in a large bowl. Mix the cheese into the egg mixture and pour over the top of the hashbrowns. Cover with a layer of paper towels and cook for 3 hours or until the eggs are set in the center. Can this be made in a regular, deep (original) crock pot? Yes you can make this in an oval crock pot but the cooking times will have to be adjusted. Depending on the size of your crock pot the cooking time will be longer. Enjoy the recipe! I’m always so afraid to make stuff like this in my crock pot because I’m afraid I wont’ do it right. You make it look so easy! Thanks for linking up with Delicious Dishes Recipe Party! There is no need to be afraid! Crock pot cooking is so easy. Thanks for hosting!